A 1912 sovereign salvaged from the wreck of the SS Egypt is offered in our 18th April 2018 coin auction with an estimate of £500. 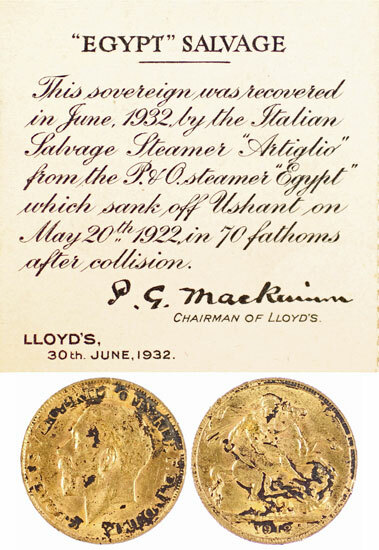 The 1912 sovereign is in a Lloyds presentation box with certificate which states “This sovereign was recovered in June 1932 by the Italian Salvage Steamer Artiglio from the P&O steamer Egypt which sank off Ushant on May 20th 1922 in 70 fathoms after collision”, signed by P G MacKinnon Chairman of Lloyds. The SS Egypt sank in the Bay of Biscay after colliding with the French ship SS Seine in 1922. 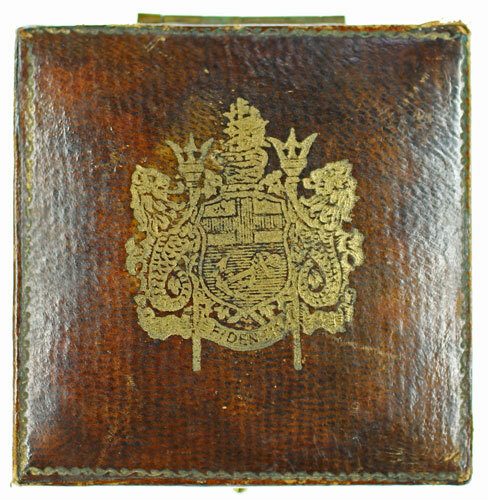 She sank with her over 1 million pounds worth of gold and silver ingots and wooden boxes of gold sovereigns. 15 passengers and 71 crew lost their lives during the sinking and 252 were saved. The 1932 salvage is thought to have recovered less than 1,000 sovereigns, with some 14,000 still at the bottom of the ocean. Are you selling a coin collection? We provide free coin valuations without obligation. Please contact coin expert paul.murray@warwickandwarwick.com if you have coins for sale for a free valuation.